Imbolg, also known as Candlemas, comes six weeks after Yule and six weeks before the Spring Equinox. 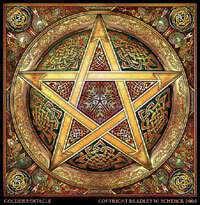 At this time, Witches honor the Celtic Triple Goddess Brid (pronounced Breed) in her maiden aspect. Brid or Brigid is goddess of fire, inspiration, healing, craftsmanship, and midwifery. She is patroness of the hearth, poets, smiths, craftspeople, healers, and priests. Imbolg is the winter Festival of Lights. It is the quickening of the year, the first fetal stirrings of Spring in the womb of Mother Earth. Spring lies within sight and the seed is prepared for sowing. It is a fire festival, but emphasis is put on light rather than heat -- light as it begins to pierce the gloom of winter. February 2 is also Groundhog's Day (USA). The groundhog is a manifestation of the God. He has been sleeping since Samhain and stirs in his slumber to get a take on the coming light. Decorate the altar with white flowers. Have a white votive candle within the cauldron. Lay your besom upon the altar. At Imbolg, witches cast for fertility and protection in their lives. Imbolg is a good time to get your life in order, spiritually,mentally, emotionally, and physically. Make the Bride's Bed using the corn or wheat doll make the previous Lughnasadh. Create a sun wheel or Brigid's Cross for each room in the house. Burn the old ones. Hang a scarf outside on the eve of Imbolg and Brigid will bless it with healing powers. Place three ears of corn on the door as symbol of the Triple Goddess and leave until Ostara. Imbolg is a traditional time for Witches' dedications, rededications, and initiations. Cleanse your sacred space and altar tools with a simple Imbolg besom rite. For a simple Imbolg observance, light a white candle and burn sandalwood. By the power of this smoke, I wash away the negative influences that this place be cleansed for the Lady and her babe. On Imbolg Eve, it is customary to leave food and drink out for Brigid -- buttered bread, milk, grains, or seeds. Also leave buttered bread in a bowl indoors for the faeries who travel with the Lady of the Greenwood. Next day, dispose of it outside as the "essence" has been removed. Let this be the traditional time that you make candles for the coming year, infusing them with color, power, herbs, and scent depending on the magickal purpose. Bless candles that you will be using for rituals throughout the year. Imbolg is the traditional time to collect stones for new magick circles and general magickal use. Use your BACK button to return this site. Here's a lesson on magickal stones I wrote for a spellworks class.